Money warrant for 46l. 12s. 7d. to the Agents for Taxes, to be by them immediately repaid into the Exchequer on William Love's account as Receiver General of the second 4s. Aid for co. Huntingdon, representing an overpayment on his account of the second Quarterly Poll for said county. (Money order dated April [sic for May] 6 hereon.) (Reference of Love's petition for this transfer.) Money Book XII, p. 505. 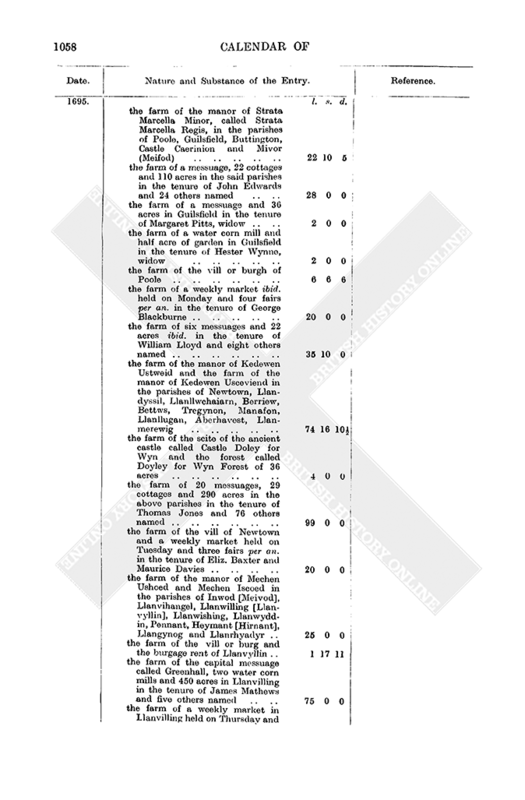 Order Book IV, p. 188. Reference Book VII, p. 94. William Lowndes to the Auditor of the Receipt to issue 1,554l. 16s. 0d. 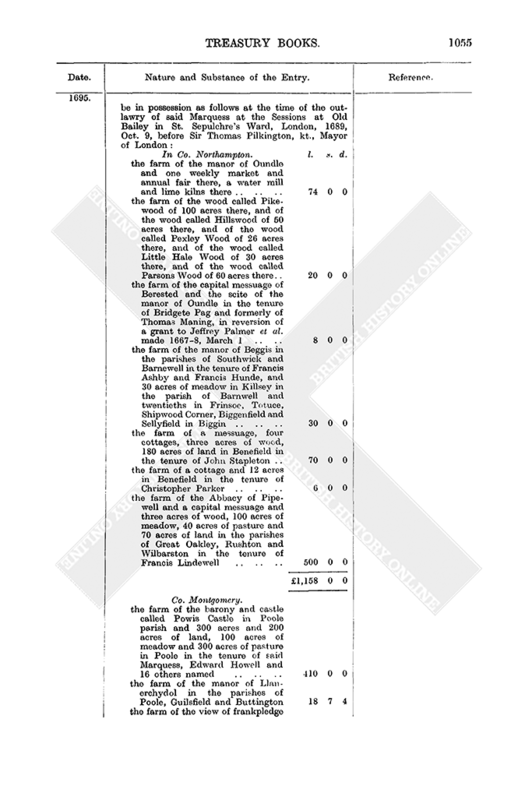 to Charles Fox and Lord Coningsby on the unsatisfied order in their name for the service of the Forces, Ireland: to be issued out of loans on Duties on Marriages etc. 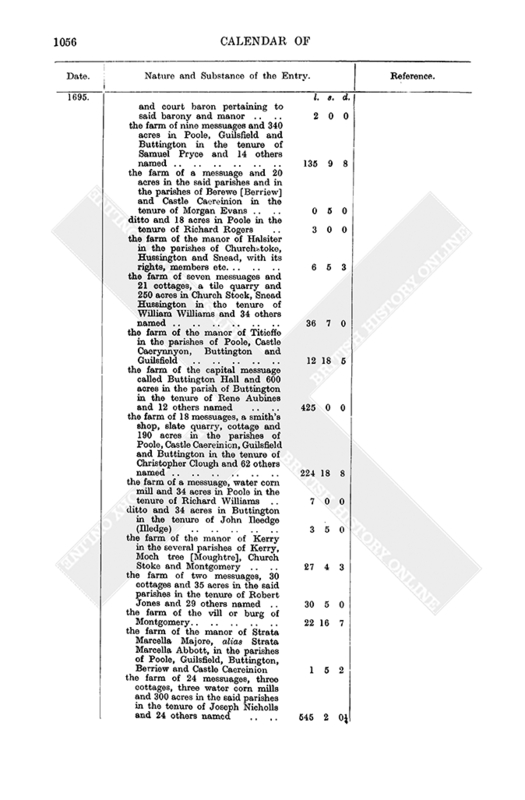 : and to be paid to the Commissioners of Transports to answer several bills of exchange drawn upon the Treasurer of the Navy by Col. Codrington and Col. Kendall for hire of ships in the West Indies in the late Expedition to Martinique. (Same to the said Commissioners to so apply same.) Disposition Book XII, p. 247. 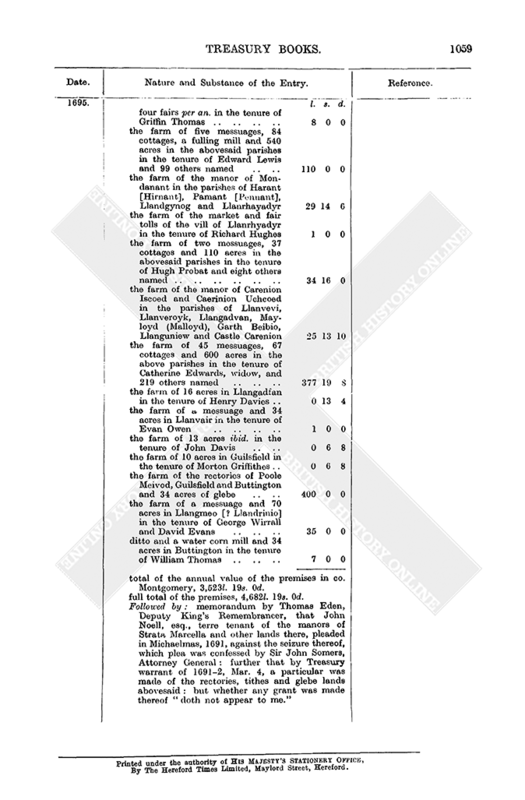 Appending: list of said bills: l. s. d.
William Lowndes to the Auditor of the Receipt for tallies of pro on the Excise for 1,500l. to Isabella, Duchess Dowager of Grafton, and Charles, Duke of Grafton, her son, for half a year to Lady day last on their pension. (Same dated May 15 to the Excise Commissioners to satisfy said tallies.) Disposition Book XII, pp. 248, 263. Affidavit by Benjamin Scott of London, merchant, of his shipping in London port, 1694, Nov. 13, of 30 chalder of sea coal in the Success, Thomas Bur-wash master, for Barbados; and on 1693, Dec. 5 and 8, of certain leather, silk, plain globes, perpetuanos, English ticken, wheat, tin and turnery wares, pills, fans, masks, commodes bonelace, hair fringes etc., which, ship with all its goods utterly perished in the sea 1694, Dec. 22, betwixt Beachy and the Isle of Wight: [said affidavit being made with a view to allowance of equivalent Customs free shipment of other goods]. Out Letters (Customs) XII, p. 171. 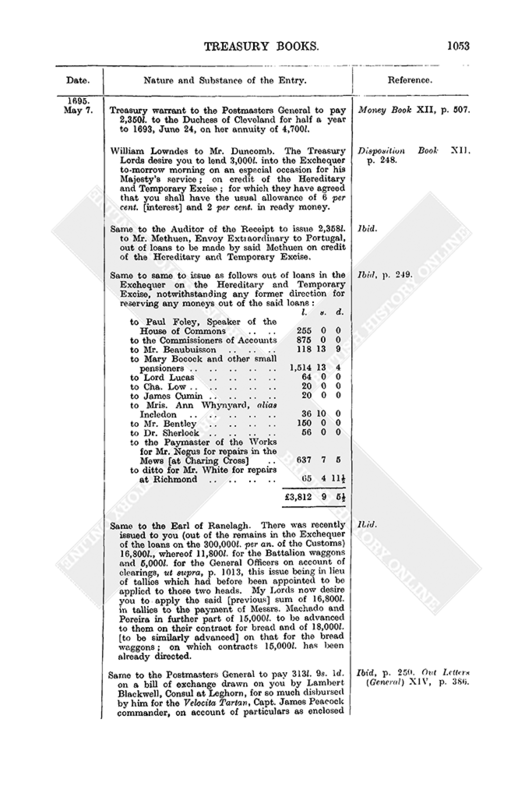 Treasury reference to the Agents for Taxes of the petition of Edward Mitchell, Receiver General for co. Gloucester of the second Quarterly Poll and second 4s. Aid, praying for an overpayment of 455l. 14s. 3¾d. on the latter account to be transferred to the former. Reference Book VII, p. 94. 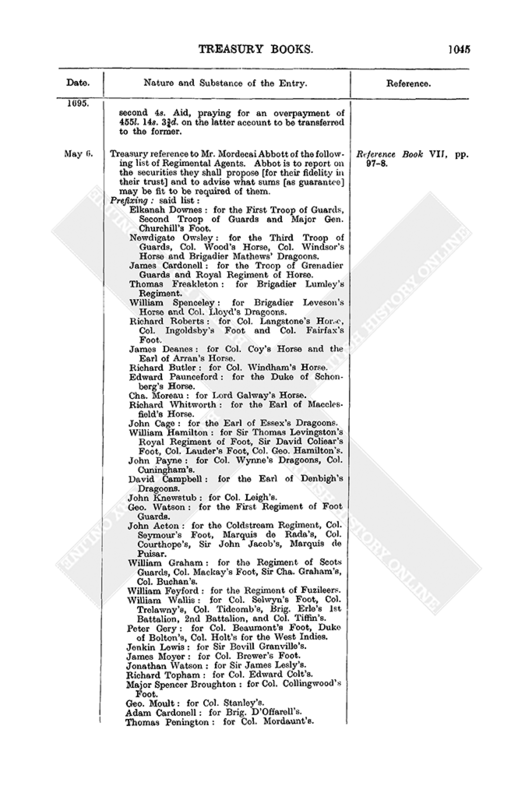 Treasury reference to Mr. Mordecai Abbott of the following list of Regimental Agents. Abbot is to report on the securities they shall propose [for their fidelity in their trust] and to advise what sums [as guarantee] may be fit to be required of them. Reference Book VII, pp. 97–8. Elkanah Downes: for the First Troop of Guards, Second Troop of Guards and Major Gen. Churchill's Foot. Newdigate Owsley: for the Third Troop of Guards, Col. Wood's Horse, Col. Windsor's Horse and Brigadier Mathews' Dragoons. James Cardonell: for the Troop of Grenadier Guards and Royal Regiment of Horse. Thomas Freakleton: for Brigadier Lumley's Regiment. 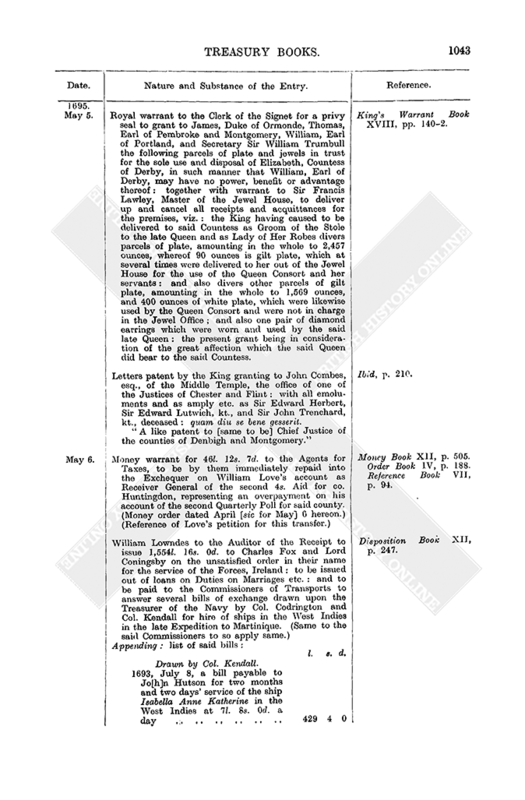 William Spenceley: for Brigadier Leveson's Horse and Col. Lloyd's Dragoons. Richard Roberts: for Col. Langstone's Horse, Col. Ingoldsby's Foot and Col. Fairfax's Foot. James Deanes: for Col. Coy's Horse and the Earl of Arran's Horse. Richard Butler: for Col. Windham's Horse. Edward Paunceford: for the Duke of Schonberg's Horse. Cha. Moreau: for Lord Galway's Horse. 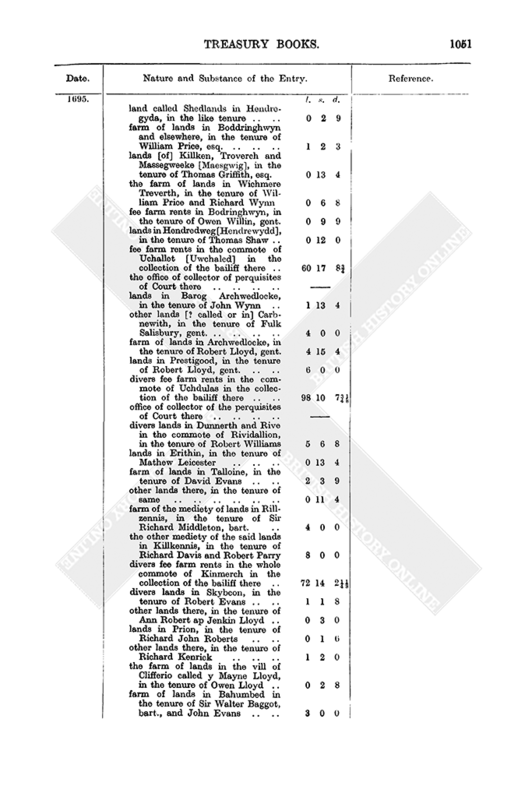 Richard Whitworth: for the Earl of Macclesfield's Horse. John Cage: for the Earl of Essex's Dragoons. William Hamilton: for Sir Thomas Levingston's Royal Regiment of Foot, Sir David Coliear's Foot, Col. Lauder's Foot, Col. Geo. Hamilton's. John Payne: for Col. Wynne's Dragoons, Col. Cuningham's. David Campbell: for the Earl of Denbigh's Dragoons. John Knewstub: for Col. Leigh's. Geo. Watson: for the First Regiment of Foot Guards. John Acton: for the Coldstream Regiment, Col. Seymour's Foot, Marquis de Rada's, Col. Courthope's, Sir John Jacob's, Marquis de Puisar. William Graham: for the Regiment of Scots Guards, Col. Mackay's Foot, Sir Cha. Graham's, Col. Buchan's. William Feyford: for the Regiment of Fuzileers. William Wallis: for Col. Selwyn's Foot, Col. Trelawny's, Col. Tidcomb's, Brig. Erie's let Battalion, 2nd Battalion, and Col. Tiffin's. Peter Gery: for Col. Beaumont's Foot, Duke of Bolton's, Col. Holt's for the West Indies. Jenkin Lewis: for Sir Bevill Granville's. James Moyer: for Col. Brewer's Foot. Jonathan Watson: for Sir James Lesly's. Richard Topham: for Col. Edward Colt's. Major Spencer Broughton: for Col. Collingwood's Foot. Geo. Moult: for Col. Stanley's. Adam Cardonell: for Brig. D'Offarell's. Thomas Penington: for Col. Mordaunt's. David Nairne: for Col. Maitland's and Col. Ferguson's. Peter Potter: for Col. Saunderson's. James Campbell: for Lord Lorne's. Tracy Pauncefort: for Col. Fred Hamilton's. P. Daval: for Col. La Meloniere's. Jansen de Tudebeuf: Col. Belcastle's. John Payne: Sir Hen. Belasye's, Col. Coote's, Col. Brudenall's. John Meenis: for Col. Gibson's. Peter Bernard: for Col. Farrington's. Richard Harnage: for Col. Northcote's. William Bridges: for Col. Russell's. Tracey Pauncefort: for the Company of Miners. 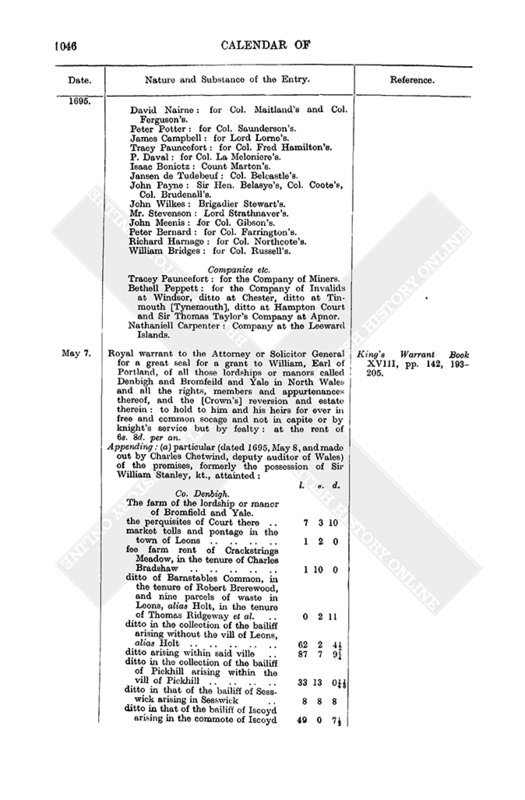 Bethell Peppett: for the Company of Invalids at Windsor, ditto at Chester, ditto at Tin-mouth [Tynemouth], ditto at Hampton Court and Sir Thomas Taylor's Company at Apnor. 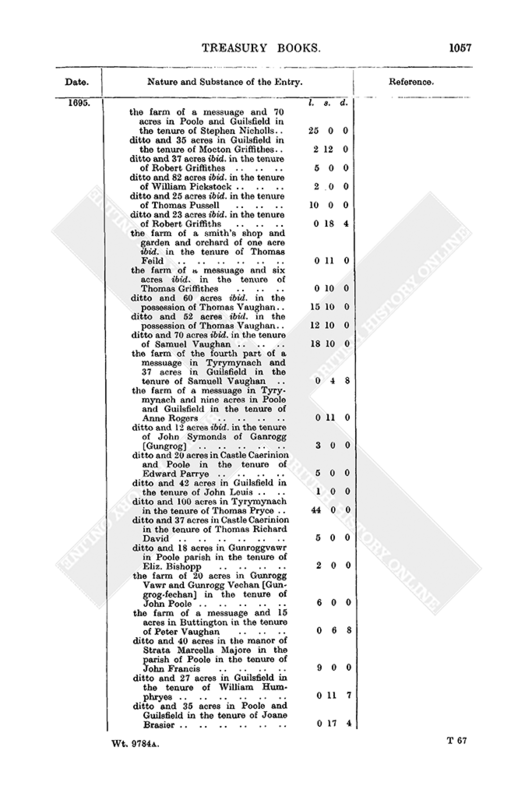 Nathaniell Carpenter: Company at the Leeward Islands. Royal warrant to the Attorney or Solicitor General for a great seal for a grant to William, Earl of Portland, of all those lordships or manors called Denbigh and Bromfeild and Yale in North Wales and all the rights, members and appurtenances thereof, and the [Crown's] reversion and estate therein: to hold to him and his heirs for ever in free and common socage and not in capite or by knight's service but by fealty: at the rent of 6s. 8d. per an. King's Warrant Book XVIII, pp. 142, 193–205. 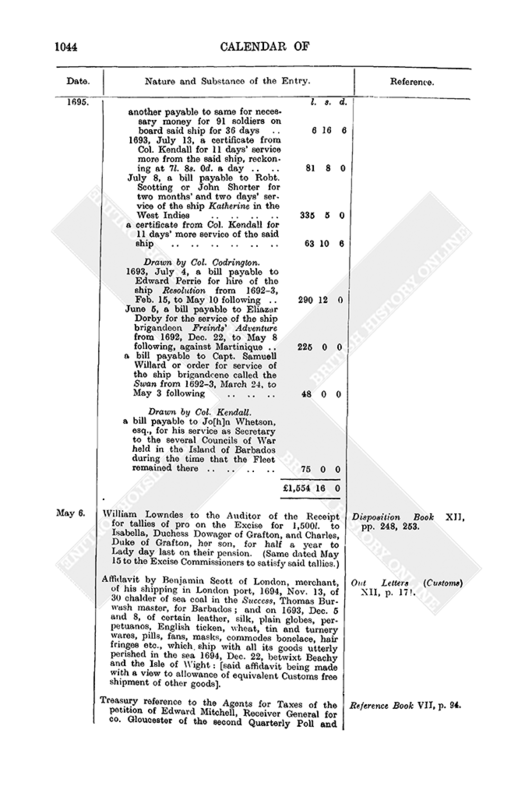 Appending: (a) particular (dated 1695, May 8, and made out by Charles Chetwind, deputy auditor of Wales) of the premises, formerly the possession of Sir William Stanley, kt., attainted: l. s. d.
The farm of the lordship or manor of Bromfield and Yale. 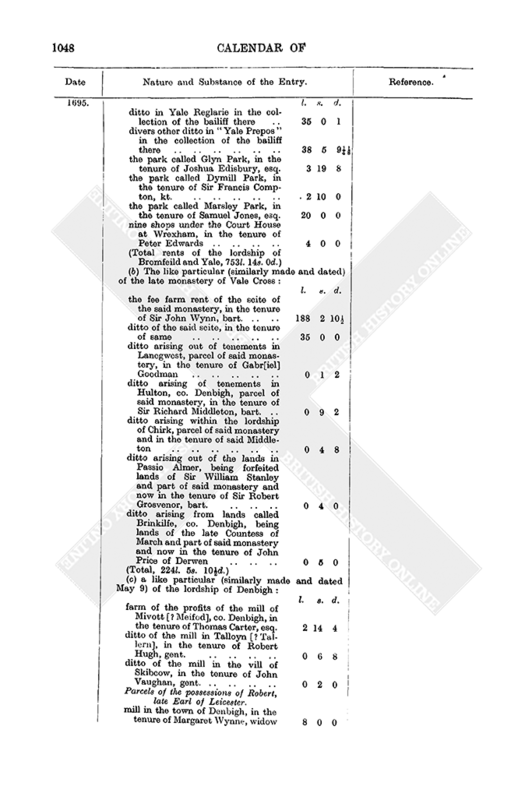 (b) The like particular (similarly made and dated) of the late monastery of Vale Cross: l. s. d.
(c) a like particular (similarly made and dated May 9) of the lordship of Denbigh: l. s. d.
Followed by: Surveyor General's ratal of the above particular. 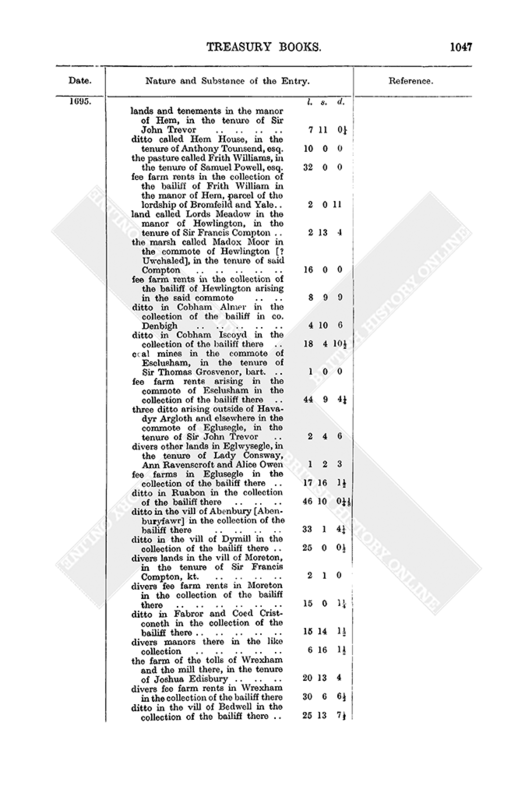 The abovesaid lordships and manors of Denbigh and Bromfield and Yale have been valued at 1,720l. 16s. 3d., and now by the abovesaid particulars at 1l. 3s. 0d. more, over and above royalties, mines, improvements. This ratal is made out under a Treasury warrant of 1695, May 4, in order to a grant thereof to John Neale [in trust for said Earl of Portland]. Treasury warrant to the Postmasters General to pay 2,350l. to the Duchess of Cleveland for half a year to 1693, June 24, on her annuity of 4,700l. Money Book XII, p. 507. William Lowndes to Mr. Duncomb. The Treasury Lords desire you to lend 3,000l. into the Exchequer to-morrow morning on an especial occasion for his Majesty's service; on credit of the Hereditary and Temporary Excise; for which they have agreed that you shall have the usual allowance of 6 per cent, [interest] and 2 per cent, in ready money. Disposition Book XII. p. 248. Same to the Auditor of the Receipt to issue 2,358l. to Mr. Methuen, Envoy Extraordinary to Portugal, out of loans to be made by said Methuen on credit of the Hereditary and Temporary Excise. Ibid. Same to same to issue as follows out of loans in the Exchequer on the Hereditary and Temporary Excise, notwithstanding any former direction for reserving any moneys out of the said loans: l. s. d. Ibid, p. 249. Same to the Earl of Ranelagh. There was recently issued to you (out of the remains in the Exchequer of the loans on the 300,000l. per an. of the Customs) 16.800l., whereof 11,800l. for the Battalion waggons and 5,000l. for the General Officers on account of clearings, ut supra, p. 1013, this issue being in lieu of tallies which had before been appointed to be applied to those two heads. My Lords now desire you to apply the said [previous] sum of 16,800l. in tallies to the payment of Messrs. Machado and Pereira in further part of 15.000l. to be advanced to them on their contract for bread and of 18,000l. [to be similarly advanced] on that for the bread waggons; on which contracts 15,000l. has been already directed. Ibid. Same to the Postmasters General to pay 313l. 9s. 1d. on a bill of exchange drawn on you by Lambert Blackwell, Consul at Leghorn, for so much disbursed by him for the Velocita Tartan, Capt. 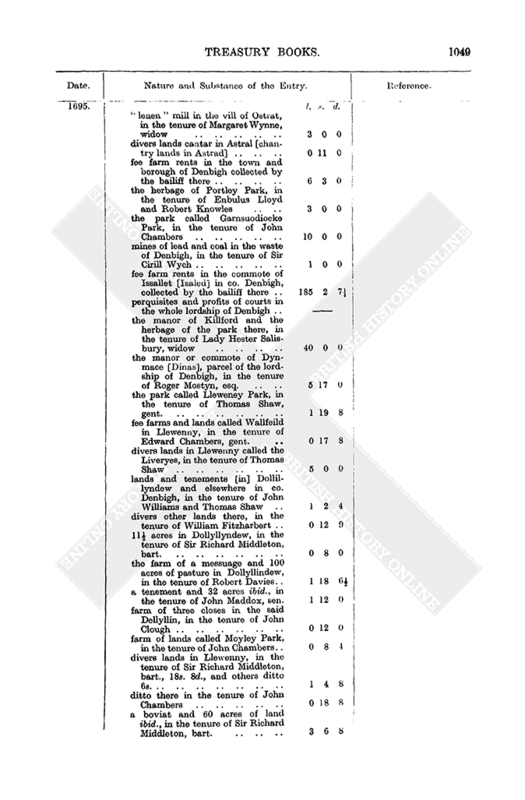 James Peacock commander, on account of particulars as enclosed [missing] allowed by Secretary Sir John Trenchard by the King's command. Ibid, p. 250. Out Letters (General) XIV, p. 386. William Lowndes to the Auditor of the Receipt to issue to Edward Nicholas 18,857l. 14s. 3d. on the order in his name for the arrears of the wages to the servants of the late Queen; and is intended to clear her debts to tradesmen and artificers: to be issued out of loans to be made by said Nicholas on credit of the Hereditary and Temporary Excise. Disposition Book XII, p. 255. Same to same to issue 63,313l. 14s. 5d. to the Earl of Bradford on the order in his name for the service of the Household: to be applied to clear that [the Cofferer's] Office to 1694, Sept. 29: to be issued out of loans made or intended to be made on credit of the Hereditary and Temporary Excise. Ibid. Same to the Navy Commissioners. You have not sent any of your printed weekly certificates of receipts and payments by the Navy Treasurer since Feb. 28 last. My Lords direct you to transmit to them forthwith all the missing certificates to this time and that you send them weekly for the future. Out Letters (General) XIV, p. 384. 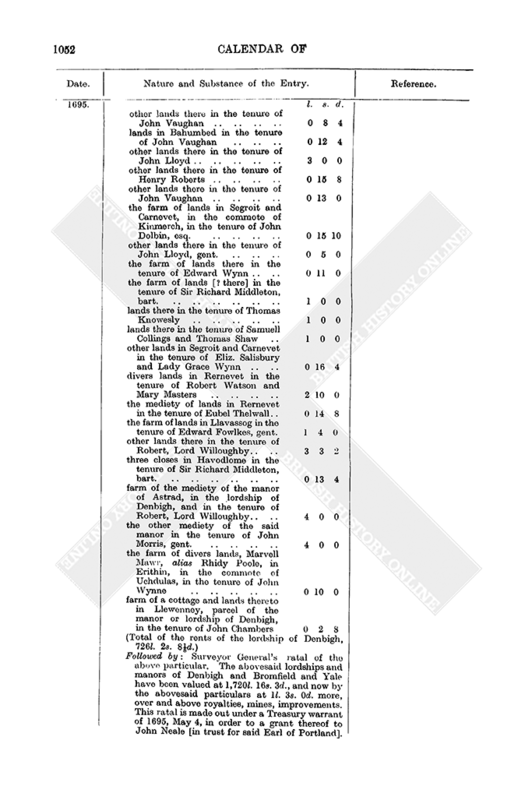 The Treasury Lords to the Lord Deputy, Trolaud, to report on the enclosed petition [missing] of Francis, Earl of Longford, and Lady Ann his wife, praying a stay to the proceedings on Col. Wolsley's letter for a grant of a mortgage alleged to be forfeited by the outlawry and attainder of Sir Daniell Arthur of an estate in Dublin called White Fryars: said petition being referred to the Treasury by the King. Out Letters (Ireland) VII, p. 24. Royal warrant to the Attorney or Solicitor General for a great seal for a grant to William D'Nassau, Seigneur de Zulestein, of the premises found by inquisition as follows, being the forfeited estate in co. Northampton of William, late Marquess of Powys, as found by inquisition taken at the Talbott in Oundle, co. Northants, 1690–1, Jan. 2, before John Radford et al., being therein mentioned to be worth 1,158l. per an. ; and likewise of the barony and castle called Powys Castle and other manors, lands etc., fairs, tolls etc., in co. Montgomery, similarly found by inquisition taken at the town of Montgomery 1691, Sept. 2, before Pryce Devereux et al., being therein mentioned to be worth 3,524l. 19s. 0d. per an. : and all which were thereupon seized into the King's hands. 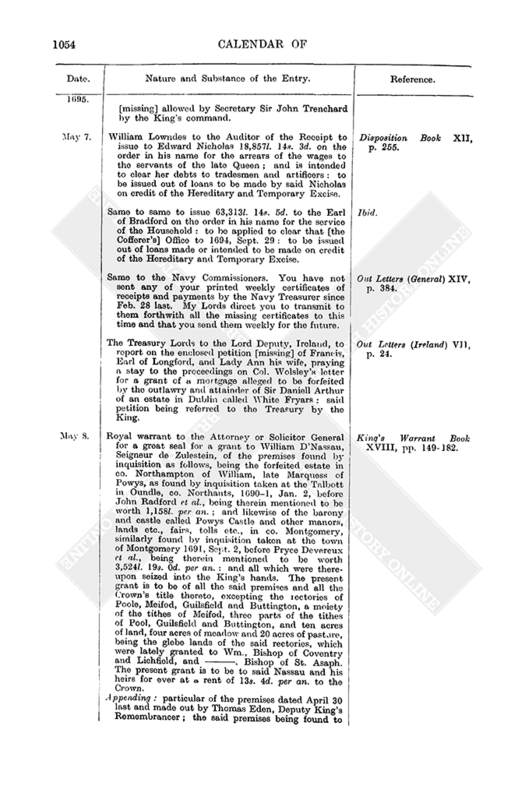 The present grant is to be of all the said premises and all the Crown's title thereto, excepting the rectories of Poole, Meifod, Guilsfield and Buttington, a moiety of the tithes of Meifod, three parts of the tithes of Pool, Guilsfield and Buttington, and ten acres of land, four acres of meadow and 20 acres of pasture, being the glebe lands of the said rectories, which were lately granted to Wm., Bishop of Coventry and Lichfield, and — Bishop of St. Asaph. The present grant is to be to said Nassau and his heirs for ever at a rent of 13s. 4d. per an. to the Crown. King's Warrant Book XVIII, pp. 149–182. 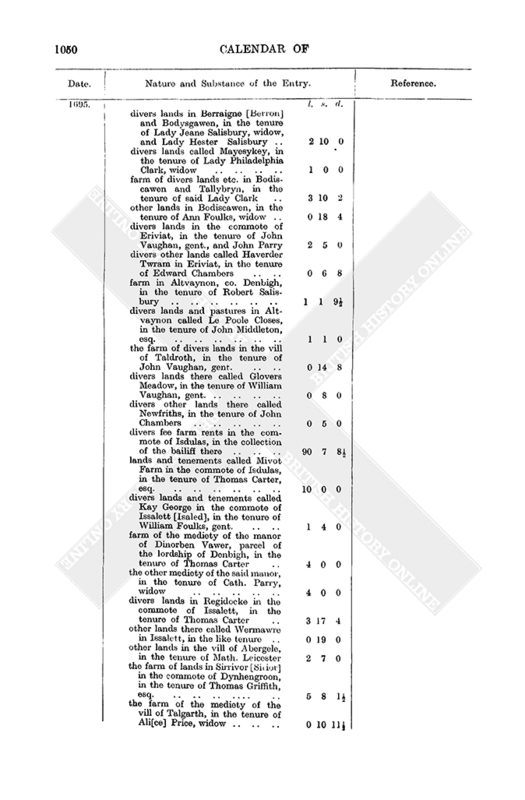 Appending: particular of the premises dated April 30 last and made out by Thomas Eden, Deputy King's Remembrancer; the said premises being found to be in possession as follows at the time of the outlawry of said Marquess at the Sessions at Old Bailey in St. Sepulchre's Ward, London, 1689, Oct. 9, before Sir Thomas Pilkington, kt., Mayor of London: l. s. d.
total of the annual value of the premises in co. Montgomery, 3,523l. 19s. 0d. full total of the premises, 4,682l. 19s. 0d.